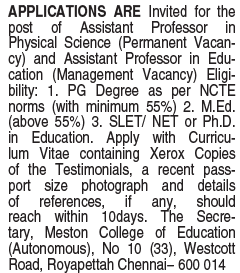 Meston College of Education, Chennai has advertised in THE HINDU Classified newspaper for the recruitment of Assistant Professor jobs vacancies. Interested and eligible job aspirants are requested to apply within 10 days from 17th June 2018. Check out further more details below. About College : The Meston College of Education is governed by the Meston Education and Development Association. The College of Education grew out of the Wesley College, which was one of the pioneering Arts Colleges in the city of Chennai for over seventy years from 1861 to 1937. It is affiliated to the TamilNadu Teachers Education Unviersity, recognized by NCTE, UGC and Government of Tamil Nadu and re-accredited by NAAC. 3. SLET/NET or Ph.D. in Education. containing Xerox copies of the Testimonials, a recent passport size photograph and details of references, If any, to the following postal address.